Dr. Lesley Anderson has been a specialist in complex knee and shoulder problems since 1986. She was born and raised in Pennsylvania where she actively participated in sports throughout college, specifically lacrosse and field hockey. She developed her interest in treating injuries of the knee and shoulder through her own personal surgeries as a teenager, when orthopedic surgery was primitive compared with current techniques. She received her BS at Penn State and completed her MD at Hershey Medical School at Penn State in 1976. At UCLA, Dr. Anderson was their first female orthopedic resident. She completed a fellowship in Knee Surgery and Sportsmedicine at the Blazina Orthopedic Clinic in Los Angeles. Since moving to San Francisco in 1985, Dr. Anderson has specialized in treating only knee and shoulder problems. She has been listed in Castle-Connelly’s “America’s Top Doctors” yearly from 2000-present. Doctors in this list are nominated and selected by their orthopedic peers. 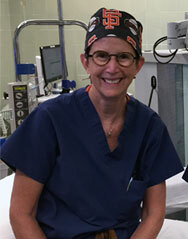 She treats the gamut of teenage knee injuries up through total joint replacement. She has been at the forefront in developing biologic resurfacing techniques of the knee for the past 20 years as an alternative to knee replacement. 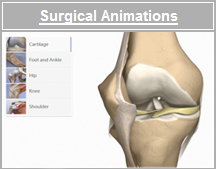 This has included meniscus transplantation, fresh allografts for treating large cartilage defects of the knee, osteochondral autografts for smaller cartilage defects to autologous cartilage implantation (MACI) for cloning the patients’ own cartilage cells for treating cartilage defects. She volunteered for the Olympic Games in LA in 1984. Her current clinical and research interests are in treating the gamut of early to late osteoarthritis with patients own tissues called biologics, including platelet rich plasma (PRP) and stem cells. She is committed to education of the patient and offering choices for treatment of knee and shoulder injuries. She is dedicated in providing the highest quality and scope of care to her patients. She individualizes each patient’s care with the focus on finding the best solution, be it nonsurgical or surgical for each person’s orthopedic problem. She enjoys developing long-term relationships with our patients and strives to provide a comfortable environment for patients to receive help with their orthopedic problems. Ideally, her care will help a patient avoid surgery in the first place. However, Dr. Anderson also understands that surgery a very frightening process for patients, having been one herself. The loss of control is a real feeling. She hopes to assist in making that process more comfortable by providing information and resources for an informed decision and experience. Our staff will there to assist you through the whole process so the patient can have the best outcome possible. Dr. Anderson sees patients in her San Francisco office located in Pacific Heights (415-923-3029). The office is located next to the California Pacific Medical Center – Pacific Campus (CPMC). Dr. Anderson is certified by the American Board of Orthopedic Surgery, and is a fellow of the American Academy of Orthopedic Surgeons, Arthroscopy Association of North America as well as the first woman member of SICOT, a prestigious international organization of Orthopedic Surgeons. She is an Assistant Clinical Professor of Orthopedic Surgery at UCSF and is committed to teaching medical students and residents in her office. She is second VP of the California Orthopedic Association and will be President in 2020. She is also chair of the Workers Compensation Committee of the COA, as she believes injured workers also should receive high quality care and help through the difficulty WC system. Please click here for her complete Curriculum Vitae.